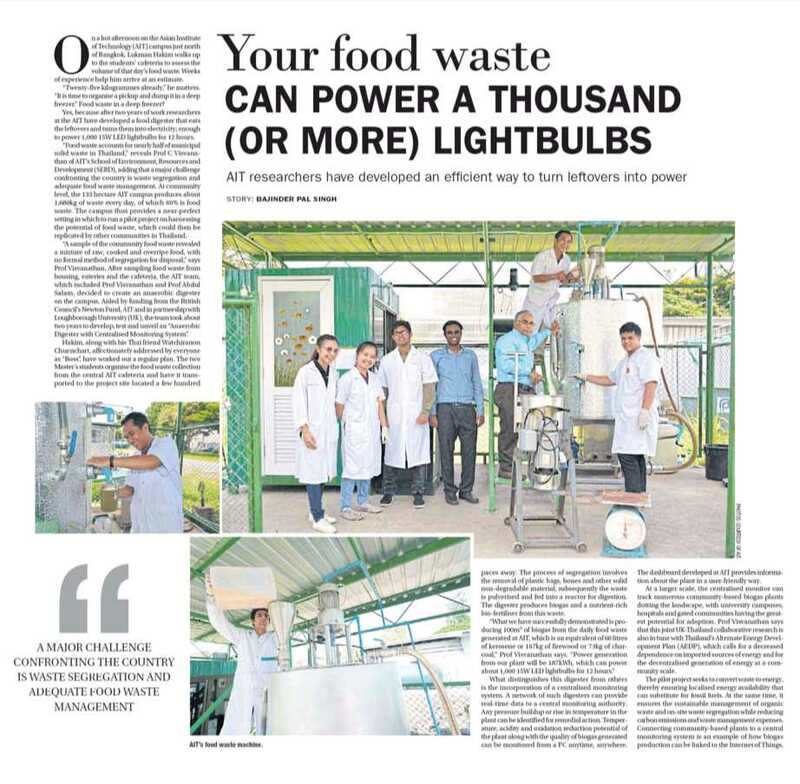 Food waste can now be recycled to power your light bulb. Not just one bulb, but one thousand 15W LED light bulbs for 12 hours. That is — if you adopt the anaerobic digester technology perfected at the Asian Institute of Technology (AIT). “Food waste accounts for nearly half of the municipal solid waste in Thailand,” reveals Prof. C Visvanathan of AIT, and a major challenge confronting the country is waste segregation and adequate food waste management. At a community level, the 133-hectare AIT campus produces about 1680 kilograms of waste every day, out of which 60 per cent is food waste. 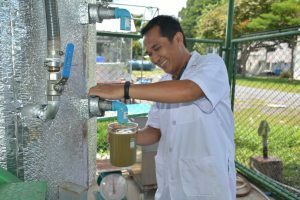 The campus thus provides a near perfect setting to create a pilot project for harnessing the potential of food waste, which could then be replicated by other communities in Thailand. On a given day, the food waste from the central AIT Cafeteria is collected and brought to project site. The process of segregation involves the removal of plastic bags, bones, and other solid non-degradable material, following which the waste is pulverized and fed into the reactor for digestion. The digester produces biogas from this waste, and nutrient rich bio-fertilizer. 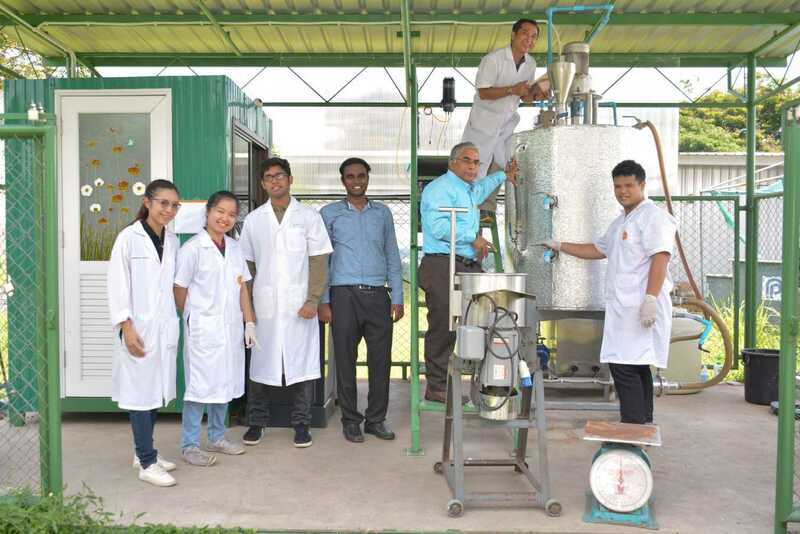 “What we have successfully demonstrated is producing 100 cubic metres of biogas from the daily food waste generated in AIT, which is an equivalent of 60 liters of kerosene, or 167 kg of firewood, or 73 kg of charcoal,” Professor Visvanathan says. Power generation from our plant will be 187 kWh, which can power about 1000 15W LED light bulbs for 12 hours. What distinguishes this digester from others is the incorporation of a centralized monitoring system. A network of such digesters can be created that provide real-time data to a central monitoring authority. Any pressure buildup or rise in temperature in the plant can be identified for remedial action. Temperature, acidity and oxidation reduction potential of the plant along with the quality of biogas generated can be monitored from laptop or PC anytime and anywhere. The dashboard developed at AIT provides information about the plant in user friendly way. When implemented at a larger scale, a centralized monitor can track numerous community-based biogas plants that could dot the landscape; with university campuses, hospitals, and gated-communities having the greatest potential for adoption. This joint UK-Thailand collaborative research is also in tune with Thailand’s Alternate Energy Development Plan (AEDP) which calls for decreased dependence on imported sources of energy and decentralized generation of energy at a community scale, Prof. C Visvanathan adds. The pilot project seeks to convert “waste to energy” thereby ensuring localized energy availability, that can substitute for fossil fuels. At the same time, they ensure sustainable management of organic waste, ensure an on-site waste segregation, and while decreasing the carbon footprint and reducing waste management expenses. Connecting the community based plants to a central monitoring system opens the potential of incorporation of “Internet of Things” to monitor these biogas plants.